By now we’ve all heard of Beer Can Chicken, haven’t we? Now we have Beer Can Burgers! Yes, yes, yes, please! Yes to a burger wrapped in bacon and filled with awesome deliciousness. Including cheese. Ya gotta have cheese in these! These are going to be perfect for Fourth of July or Father’s Day or anytime you want a burger extravaganza! I was taken aback when Beer Can Burgers came on my radar (how have I not heard of these, before?) because I thought the burgers were cooked with the beer can like the chicken is. They’re not. They’re just shaped around a beer can (or in my case, bottle.) Then they’re filled with all kinds of awesome deliciousness! What you’re after with the Beer Can Burgers is really a bacon wrapped (the bacon helps it hold together) “cup” of ground beef that you’re going to fill with just about anything you’d like. Then you’re going to cook them (or smoke them or bake them) low and slow. The bacon renders and caramelizes, the beef is flavored by both the bacon and the filling and what you’re going to get is absolutely magical. It’s like a Juicy Lucy, only more awesome – and easier. 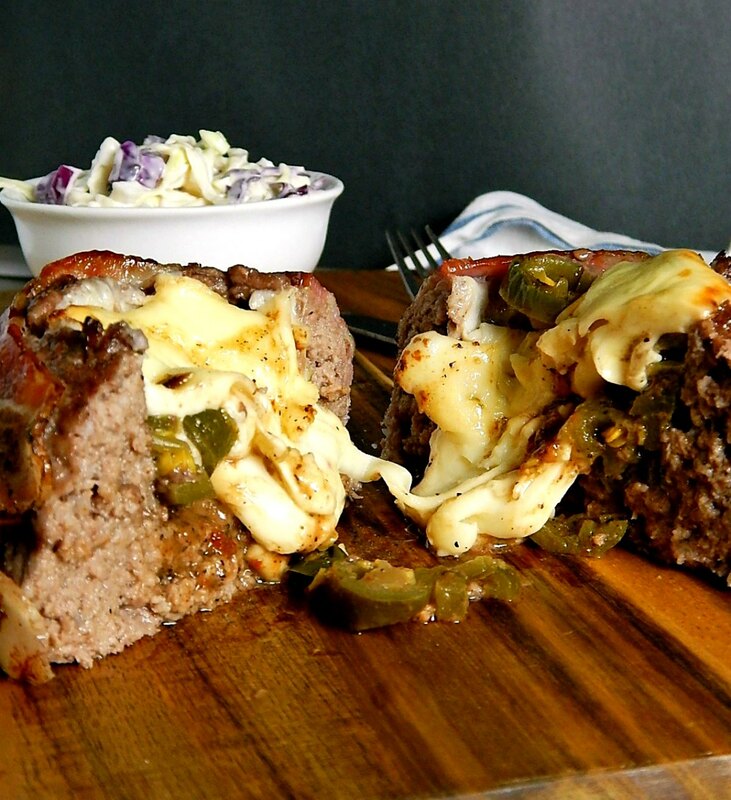 Beer Can Burgers really can be filled with just about anything. I chose my Pickled Jalapenos and Pepperjack Cheese for one and a Steakhouse Mushroom and Swiss filling for another. You can use standard burger toppings as fillings or just go wild. The possibilities are just about endless as long as you’re using something that’s pre-cooked and can withstand the long and slow cooking. So for instance, you won’t want to toss raw onions inside the Beer Can Burgers. But you can go for cooked (or caramelized, maybe with a shot of whiskey or a drizzle of beer) onions, peppers, mushrooms and so on. How about one filled with Texas Chili and Cheese? Maybe a Philly Cheesesteak filling would be more your thing. Maybe Smoked and Pulled Pork? An Italian Caprese filling would be great. Just think of how good a breakfast combo would be for brunch. Filled with sausage, hash browns, cheese and topped with an egg in the last 15 minutes of cooking. What favorite filling will you dream up? If your filling isn’t already moist, add a bit of barbecue sauce. It really helps break up a cheesier filling. The Jalapeno Pepperjack filling was great with my Pride of Deercamp Barbecue Sauce and I always have a jug in my fridge and think everyone should. Shameless plug, there!! When making Beer Can Burgers, let gluttony or good taste prevail! They’re your burgers, after all. Your choice! Do use an 80/20 or 75/25 beef for this and make sure it’s cold so it sticks well. You’ll also want to use a standard, not thick cut bacon. Bonus for cheaper, right, on both counts. Don’t worry, you’ll make up for all that savings in the fillings, lol! As far as using a can or a bottle to shape the burgers, I think a bottle works better both in size (the bacon wraps perfectly without stretching) and ease of sliding out of the ground beef “cup.” And it doesn’t have to be beer; I used a Not Your Father’s Root Beer. And yes, I did toss some of the root beer in my mushrooms – insanely good! If using a can, it should be full so it doesn’t crush and remember to wash the cans or bottles well after if you’ll be drinking from them! Beer Can Burgers – a little over 3″ is perfect for two slices of bacon. Shaping Beer Can Burgers – Size Matters! The thing about Beer Can Burgers is they really have to be big. You can try a smaller one (with one layer of bacon. I did and as it cooked, the burger shrunk and the filling spilled out. What a mess. So you really want to go with a large burger with two rows of bacon. So we’re talking about at least 8 ounces of beef per burger, which is a bit skimpy around a bottle and even skimpier around a can. I settled on 10 ounces of beef. Some people use 12 ounces or more. 10 ounces around the bottle left me with the perfect amount of burger around the edges and on the bottom, and going about 3 1/4 to 3 1/2″ up the bottle was the just the right height for the two rows of bacon. The only problem? I had to call in help to eat it all, although I almost made it! Chance gave me a hand. Gotta love a labrador!! Experiment a bit and see what works for you. Beer Can Burgers – This version is Mushroom, Onion & Swiss. Beer Can Burgers can be baked in the oven or done on a grill, gas or charcoal, and since you’re going to be cooking them low and slow (shoot for about 300 degrees) add some wood chips if you’d like. You’re looking for indirect heat on the burgers, and they are going to take some time. About 50 minutes to an hour. Using a thermometer is a bit tough since these are filled and you don’t want to do a lot of poking and it’s hard to test in the “meat” area. Test one in the center of the burger and pull your burgers about 5 degrees less than your desired doneness. Here is how to set up your grill for Indirect Heat. You don’t want to fuss with the burgers too much and for goodness sakes, try not to move them – you’ll risk damaging the bottom of the burgers and possible leakage! Maybe towards the very end, when the bottom is cooked and firm, you could gently turn the burgers to make sure all the bacon is browned and crispy. Blow torches have all kinds of useful applications in the kitchen! Rather than trying to move the burgers around, you can do what I do, and pull out a small blow torch. A blow torch is like a secret weapon (and a little impressive at a party) and I use mine for all kinds of things. I had fancy dancy little thing I got years ago for creme brulee and dumped it in favor of my reliable trigger blow torch. Big plus? I can fix my copper pipes with this, too! And the cost was about 18 bucks at the hardware store. Just carefully run the flame around any part of the bacon that isn’t cooked to perfection and you’re all set. Once your burgers are done, let them sit for a few minutes. Just long enough so that the burgers and cheese firm up a smidge and the burger won’t lose all its juiciness. And just long enough so you won’t kill yourself with the molten cheese. Serve on buns if you’d like, which I thought was really overkill, or just plate the burgers up and eat as is. Had I been thinking, I could have served my Mushroom Swiss Beer Can Burger on one of my Parmesan Crusted Crostini I made the other day but there’s still time for that for you, lol! Any of your standard sides are going to go with these. Cole Slaw, Potato Salad, Fries, etc. but depending on what kind of Beer Can Burger you’ve made, tailor your sides to your burger. That’s my Best Creamy Cole Slaw in the pic, although it looks a little like noodles. Pull out whatever you’d like to go on your burger. Tomato, lettuce, pickles etc. I was going to top my Jalapeno Cheese Beer Can Burger with a little Salsa, but once I had it out, all thoughts of doing anything but just devouring it on the spot went right out of my head! These are just insanely good! Enjoy!! Maybe I should say Enjoy Responsibly! Only the most AWESOME way to make burgers, ever! Stuffed with your favorite fillings, wrapped in bacon and slowly cooked to perfection. Set up grill for Indirect Heat. (See the PDF linked in the article under Cooking Beer Can Burgers, except you’ll aim for a temperature of 300 degrees. Smoking is optional.) Alternatively, set a wire rack over a rimmed, foil-lined baking sheet and preheat oven to 300 degrees. Form burgers into a ball. Place on cutting board and using a beer bottle (preferably) or a can press down firmly. With your hands, form beef around the bottle to a height of about 3 1/4 to 3 1/2 inches. Wrap horizontally, two slices of bacon, one to the bottom of the beef, the next just above. Carefully remove bottle and season with salt, pepper or desired seasoning. Fill burgers with desired fillings and cook for about 50 minutes for medium. Testing by thermometer tends to be problematic. I’d suggest pulling burgers about five degrees earlier than the guide below indicates. Rarer burgers will not fully cook the bacon. I’ll be sharing Beer Can Burgers at Fiesta Friday #230 Our co-host this week is Diann @ Of Goats and Greens. Diane, I don’t think even filling these burgers with veggies will redeem them in the health department but can I just say how good these would be stuffed with greens and goat cheese, lol! This entry was posted in Click here for Bargain Meals, Click here for Fabulous Food Posts and tagged Bacon, Beer, Burgers, Cheese, Ground Beef. Bookmark the permalink. Hi Lizet, sorry tb reply late! I was kind of drooling when I saw them and I’m not even that much of a burger person! I wouldn’t do this everyday, but they were marvelous! With the chicken, it’s actually placed so it stands up and the half full beer goes in the cavity, in a rather rude way, lol! Then it cooks and the beer kind of steams it from the inside out. They’re delish and moist, but the beer can can be problematic. The chicken falls over, etc. so now there are all kinds of devices to hold it up. I’ve only done beer can chicken twice. But maybe this is the summer I’ll grill one again. That looks amazing! Huge, though, I’m glad the Labrador enjoyed his share! Thanks for bringing this tasty creation to Fiesta Friday… and no, I’d never heard of beer can burgers before, either! Wait, whaat??? I thought I was set to make Jaxx’s burger roll (the bearded hiker, link #11) and now you came along with THIS?? I’m so confused! What am I supposed to make for the 4th?! The good thing is, the ingredients are the same so maybe I can experiment with both. And invite the neighbors! I know- that burger roll is MAGNIFICENT!! I can’t wait to try it, but I thought the same thing – either invite all the neighbors or just have my son, the gluttonous one, here, lol!! He’d finish it off in no time flat!! These burgers are amazing, Angie!! Wow this is such an epic idea! I love it, have to try asap! Hi and Epic is just the right word! And yes, make these asap!! 🙂 It can’t be too soon! Never heard of these! Oh my goodness, what will the foodie community think of next! They look totally decadent. Great pictures Mollie. Thanks, Liz. Funny but I’m not usually a big burger fan but I could eat one of these anytime!! Yum! I was very intrigued by the title and when I read the recipe, I was hooked! Low carb and suitable for July 4th? I’m there. Looks delicious, as do all your recipes. I can imagine the joy in your household Mollie when these come out! What a treat…. Thanks, Laura! They were fallen upon, as if by frenzied animals, that’s for sure!! And the filling of course, was the best part!! They were love at first sight, for me!! Hi Carol – well this is pretty much party food…I wanted something extravagant for the Fourth of July and well, this qualifies, lol! I know my son would eat two, bless his heart, and he’s skinny! Go figure…On the plus side? Low carb!! !